Huaxiong Huang (Mathematics & Statistics) on the CAIMS-Fields Industrial Mathematics Prize. Derek Wilson (Chemistry), Sergey Krylov (Chemistry) and Chun Peng (Biology) on their NSERC Collaborative Research and Development grant in partnership with Sanofi-Pasteur, Sciex, and Fluidigm Canada. Huaiping Zhu (Mathematics & Statistics) on receiving a grant from the Ontario Ministry of Environment and Climate Change to improve climate risk assessments in the province. Jennifer Chen (Chemistry), Derek Wilson (Chemistry) and Cody Storry (Physics & Astronomy) on their CFI Infrastructure Operating Fund grants. A team led by Dean Jayawardhana received an NSERC CREATE grant of $1.65 million for the Technologies for Exo-Planetary Science program. Two Science staff members were honoured with York University President’s Awards: Cristalina Del Biondo, graduate program assistant (Biology), received the Voice of York Award, and Howard Hunter, nuclear magnetic resonance technologist (Chemistry) received the Ronald Kent Medal. The Centre for Atmospheric Chemistry hosted a workshop for Science graduate students and postdoctoral fellows that focused on bridging the gap between science and policy. 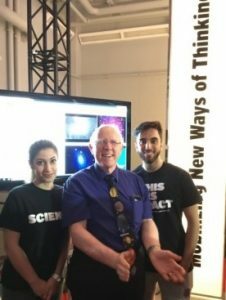 Maurice Bitran, CEO of the Ontario Science Centre, led the workshop, which was supported by the NSERC CREATE Integrating Atmospheric Chemistry and Physics from Earth to Space program. 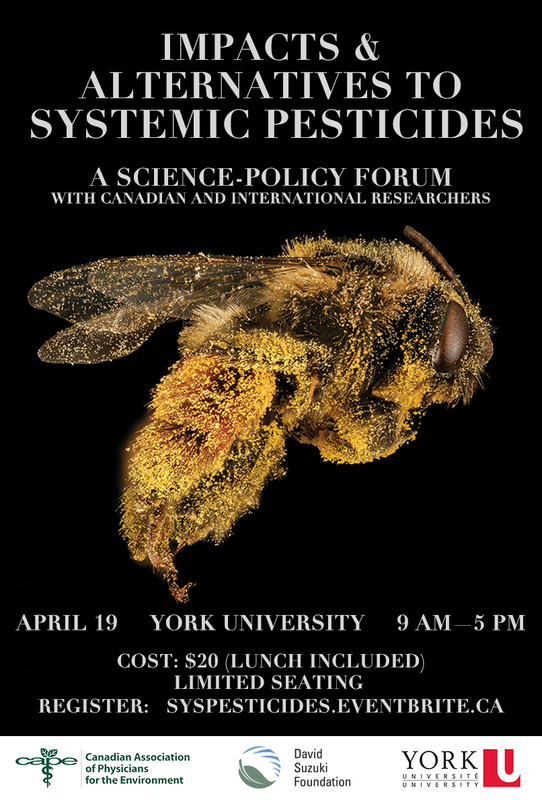 The David Suzuki Foundation and York University co-hosted “Impacts of & alternatives to systemic pesticides: a science-policy forum.” Laurence Packer and Amro Zayed (Biology) were among the speakers. Laurence delivered the keynote address on bee diversity, and Amro spoke about the consequences of pesticides on honeybee health. The Faculty of Science co-hosted the York Region Science & Technology Fair, which drew a large number of grades 7-12 students, teachers and families to campus. The event was covered by CTV News. Many thanks to Robert Tsushima (Biology) for serving on the organizing committee, and to all the volunteers. Ernie Hamm (Science & Technology Studies) has been invited as a Visiting Professor at the Ecole des Hautes Etudes en Sciences Sociale, Paris, for May and June 2016. PhD student Benjamin Voloh (Biology) represented York University at the provincial Three Minute Thesis (3MT) finals held at Wilfrid Laurier University. Four teams participated in the international Mathematical Contest in Modelling. Among the York teams were a Meritorious Winner (Top 8%) and an Honorable Mention (Top 34%). In the 76th William Lowell Putnam Mathematical Competition, the York team ranked 144th among 554 institutions in North America. York’s top individual score this year was from Stanislav Balchev, who ranked 640 among 4275 contestants. York U launched the Impact Campaign, a $500M fundraising and alumni engagement effort. The Faculty of Science was well-represented at the launch by Paul Delaney (Physics & Astronomy) and his intrepid team of students from the York Observatory. Paul and his team hosted a station representing one of the University’s campaign themes, Mobilizing New Ways of Thinking. Faculty members in the Department of Physics & Astronomy have made donations totalling more than $25K to create a permanent Colloquium Fund. The fund will be endowed and will generate annual income to supplement the department’s colloquium budget. A study co-led by Sapna Sharma (Biology) on ice cover and climate change was covered by National Geographic, National Geographic Voices, CBC News, CBC Radio’s Quirks & Quarks, and the Smithsonian magazine, among others. PhD graduate Jesse Rogerson (Physics & Astronomy) was interviewed by CBC Radio about fighting fire in outer space and Breakthrough Starshot. Huaiping Zhu (Mathematics & Statistics) spoke about the Zika virus in a feature on Fairchild TV. Alumnus Peter Pekos, late professor Doug Butler (Chemistry), and the company they co-founded, Dalton Pharma Services (which Pekos currently heads), were profiled in Chemical & Engineering News for the company’s work in helping bring a cancer drug closer to market. 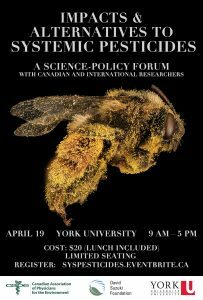 Laurence Packer’s (Biology) advice on how to protect bees was featured in an article in Global News. Paul Delaney (Physics & Astronomy) spoke with Sirius XM about the large black hole in NGC1500, and with CHML 900AM, Global TV and CJAD 800AM about Breakthrough Starshot. May 5: Research or Business? You can do both! 3–6pm, Seminar Room 105, Life Sciences Building. May 7: Science Rendezvous in Markham, 10am–3pm, Main Street Markham. May 9: Mercury in Transit, 9am–2pm, Lion Stadium. May 13: 42nd Annual Biology Symposium, 2:30-8:30pm, Accolade East Building – CIBC Lobby.